[無料] Low Battery Saver | Mac App Storeのアプリ検索・ランキング BuzzMac! Never lose time and work again because your MacBook battery died! Even if you avoid losing work just a few times, Low Battery Saver is worth getting. "Low Battery Saver delivers." - Dan Moren, MacWorld review. Low Battery Saver prevents the infuriating moment when your MacBook begins to hibernate -- a very slow process -- while you are in the middle of working. Even worse, many MacBooks will die completely when their battery gets low, without hibernating, causing you to lose whatever you were working on. So if you ever ignore the default low battery warning and end up having your computer die or hibernate, you need this app. 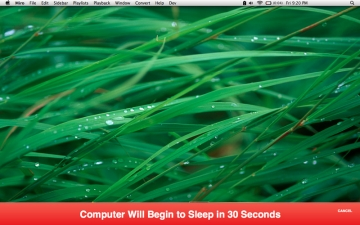 If you ever walk away from your computer and come back to a dead laptop, you need this app. 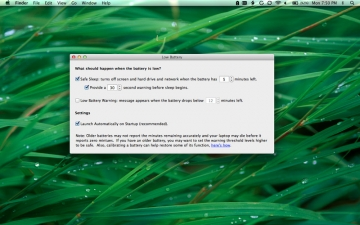 • Sleep your MacBook automatically when the battery drops below the level you set. This conserves battery before the computer dies completely. • Provides a clear warning message before sleep begins-- giving you a chance to plug in or ignore the warning (if you dare!). • Launch on startup so that you are always protected.